NEEC's mission is to promote energy efficiency policies, programs and technologies that create jobs and foster economic growth and environmental improvement. A multi-functional energy efficiency headquarters in Seattle, Washington. This facility is a place to meet, train and access our Tool Lending Library. 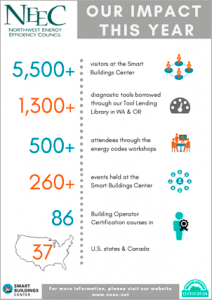 Diagnostic tools for short term loan available to building owners, managers and energy service professionals in Washington and Oregon. A training program that offers facilities personnel skills and knowledge to transform workplaces to be more comfortable, energy-efficient and environmentally friendly. NEEC members provide world class energy efficiency products and services for customers. Search for NEEC members by name or type of product/service. Company profiles and contact information for Benchmark Providers in Seattle and Portland and Tune Up Service Providers. Providing members with the most up-to-date information within the industry. 2017 was a solid year of performance for NEEC. We’re proud to continue our efforts to promote the energy efficiency industry in 2018. Join the NEEC mailing list for energy efficiency industry news and events.